It's Hip 2 Serve! 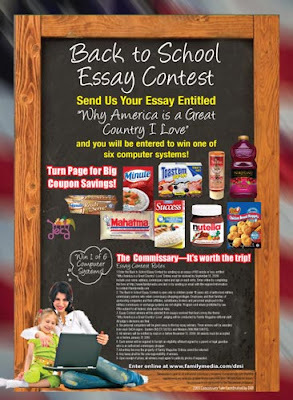 : 2009 Back To School Essay Contest-Win a New Home Computer System!! 2009 Back To School Essay Contest-Win a New Home Computer System!! Check out this contest open to all students (under 18 years old) who are dependents of authorized commissary/exchange shoppers. In order to enter, students must write an essay of 100 words or less, entitled “Why America Is A Great Country I Love.” Entries must be received by October 5, 2009, and winners will be selected from essays received that best convey the theme “Why America Is A Great Country I Love.” Be sure to include your name, address, commissary name, age, phone number, email and parent/guardian name on each entry. Students can enter online by completing the form found here or by sending an email with the required information to contest@familymedia.com. The contest web-site states that you can enter as often as you'd like?! Winners will be selected from each DeCA region (Eastern, Western and Europe) for a total of 6 prize winners each winning a new home computer system! All winners will be notified by mail on or before November 15, 2009. Good Luck! !